The idea here is to link up different lunar periods in a schematic intended to show how they integrate into a ‘bigger picture’, for lack of a better phrase. The top line of the chart contains original data. The rest shows the differences between the original figures (e.g. 2079 – 1973 = 106) in a structured format. By using periods where there’s a good match with whole numbers, the patterns of the relationships can perhaps more readily be identified in diagrammatic form. One point to note is that one more tropical year would give 1974 = 329 x 6 (also 987 x 2). The figures at the bottom of each chart are validation only. Note here that one more draconic year would be 14554 = 766 x 19. Also that six more full moon cycles would be 12256 = 766 x 16. These differences (as -6 and -1) are reflected in the top line of chart 2. The conclusion is that the charts closely follow lunar periods, so the relationships shown should be reasonably accurate over the long term. The basic period appears to be 1973 tropical years, which is 987 x 2, – 1 (see chart 1). 987 is a Fibonacci number. 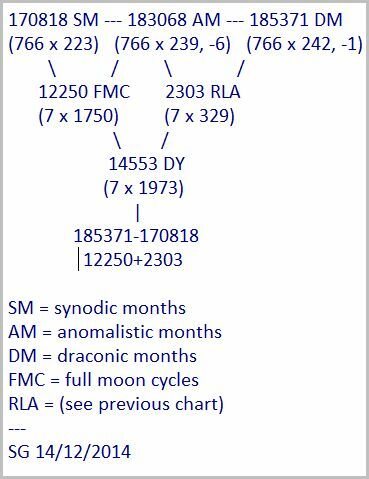 The difference between the number of draconic years and full moon cycles in chart 1 is 329 (as shown), which is 987/3. (The second chart is just a factor of 7 greater than the first one so the same comments apply). I will go this far and say the moon could moderate solar activity impacts on the climate to some degree but no further. @oldbrew wrote: Let’s go 6 times the numbers. And, this is indeed one of the best matching perigee intervals for same-phase syzygy, about one month slack (delta longitude is 20.~°) in the equinoctial year, 34804.98~ synodic (5 x 6961) and 1027812.06~ days (2 x 2 x 3 x 97 x 883), in my usual 7ka time-frame. No wonder (me thinks), since draconic has min (abs) inclination° to max (abs) inclination° at the interval’s ends. Under ‘The ratio of synodic months per half eclipse year and per eclipse year yields the same series:’ we find that the last entry in column ‘SM/full EY’ is ‘4519/385’. The closing comment is: ‘Each of these is an eclipse cycle’. 55, 89 and 144 are Fibonacci numbers. Maximum discrepancy less than 1 day. @oldbrew who wrote: 55, 89 and 144 are Fibonacci numbers. Maximum discrepancy less than 1 day. 1] It’s 24.0~ times the 6 years wobbling plane, at both ends of the interval are draconic and apsidal in same phase. 2] checked in my 7ka time-frame: at 2 x the interval are eclipses at both ends (66%+ of the pairs). 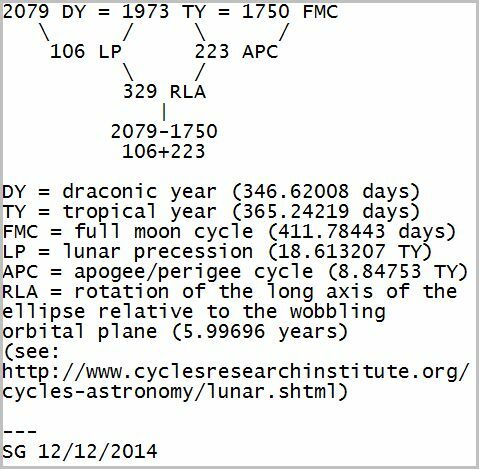 Notes re the fact 1 Saros is almost 19 draconic years (DY) and almost 16 full moon cycles (FMC). One draconic year is ‘lost’ every 754 Saros. One group of 16 full moon cycles is ‘lost’ every 2040 Saros (= 2 FMC every 255 Saros). 13, 34 and 377 are Fibonacci numbers. The exact duration and number of [members] in a complete Saros [series] is not constant. A series may last 1226 to 1550 years and is comprised of 69 to 87 [members]. 1226 years is the period of 34 x 2 Saros. It starts and finishes with a Saros: 34 x 2, +1 = 69. The previous comment was to explain the difference between ONE Saros and 16 FMC or 19 DY. Your 34 x 2, +1 = 69 Saros, thanks will pursue, my idea is continuation of two series separated by a dual eclipse (don’t hold breath). Also re 87 Saros: that’s 3 x 29, and 13 x 29 = 377 – see earlier comment @ 9:38 AM. Plotted are 7ka which include 5ka NASA eclipse canon, can you tell which gaps have been averaged and which not? @ Chaeremon: No, all I can say is that 1 draconic year is ‘lost’ every 14325 DY (or 754 Saros) compared to the idea that 1 Saros = 19 DY. That averages to just over 11 hours per Saros, but it’s a 3-body question and obviously those figures say nothing about orientation. Since ‘the initial and final eclipses in a Saros series fall near the north or south pole’ (from earlier link) the 754 Saros could be 377 each for N and S? @oldbrew, you asked: Since ‘the initial and final eclipses in a Saros series fall near the north or south pole’ (from earlier link) the 754 Saros could be 377 each for N and S? This one is a bit odd, not sure if it means anything.